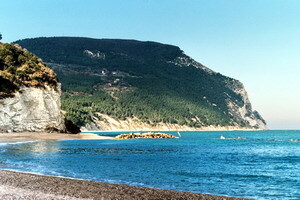 The region of Le Marche (pronounced "lay Markay"), together with Toscana and Umbria, portrays the charm of Central Italy. Located at east centre, it's the calf of Italy's boot. From the plains on the Adriatic coast, the territory gently raises with mild hills in the central area, up to the Appennini Mountains. Although the coast has been popular for many years, much of the inland remains almost unspoilt, preserving the culture of authentic Italy. The region is known for pleasing visitors who come to Le Marche looking for the taste of genuine Italy, untouched by mass tourism but welcoming to foreigners. Mountain villages where the time has stood still, or small towns to discover by yourself, all immerse in the charming countryside, like Recanati, Cingoli, Jesi, Camerino, San Leo and Fermo. Interesting to visit and more popular are the bigger towns of Urbino, premises of the court of the Duke of Montefeltro in the 15th century, Ascoli Piceno with it's beautiful main square, Ancona with it's sea port and more hidden attractions, and Macerata with its annual open-air opera festival. On the sea, Sirolo, near Monte Conero is small and delightful, while for busier areas look for San Benedetto del Tronto, Gabicce and Senigallia. If you like nature, don't miss the Frasassi caves, the Furlo Gorge, the Monte Conero and the Sibillini Mountains. You can find more detailed information about all these locations on Marche Voyager, the official tourism website of Le Marche. 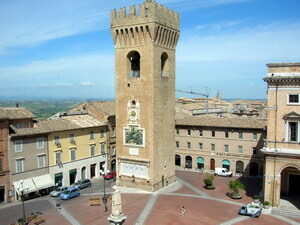 Article in The Guardian about how to visit Le Marche on a budget [published on 29th March 2013]. Kind, modest, gentle and a little bit more relaxed then people of northern Italy. That means many like, and have time, to enjoy a relaxing conversation, possibly in front of a traditional meal prepared by the home cook, just like mamma does. Once you are in the region, you will notice that knowing the basics of the language will make you enjoy the company of the locals much more. The most effective courses on the market, used by companies and government agencies, are the courses on CD and DVD of Rosetta Stone Italian. 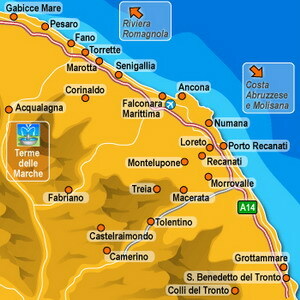 Try the hotel search on map: marche area with customer reviews and online booking provided by Venere.com. Once followed the link to their website, it is sufficient to click on the names of towns in the map like the one shown here, or check their alphabetical list on the page. Have a look at our selection of properties for sale in the region in Le Marche property if you are looking for a house in this beautiful region. The most useful site regarding Le Marche in Italy is the official regional tourist site Marche Voyager, which contains information about nature, itineraries, history, food & wine and events. You can read a more complete review of the language courses of Rosetta Stone in our articles Rosetta Stone, Rosetta Stone Web and in other languages at Rosetta Stone (in italiano), Rosetta Stone (en fran�ais), Rosetta Stone (em portugu�s) and Rosetta Stone (en espa�ol). Travel to two of the most famous capitals, New York and London and visit the best attractions there without queues with a single convenient ticket. You can't do this without London Pass, London Pass with Travelcard, New York City Pass or NewYork Pass with Travelcard.